Long time no see huh?!?! For now, I am here to share a card I made for this weeks challenge at Sentimental Sundays. I love the look of clean and simple cards and as you can see, it does not have to have tons of white space. As long there is not lots of embellishments and other distraction....It can be considered a CAS card. As you can see, this weeks sponsor is Bugaboo Stamps and I used the beautiful sketch that was created by out very own DT member: Nicole. Make sure you stop by the Sentimental Sundays blog and see the gorgeous CAS creations they created this week. 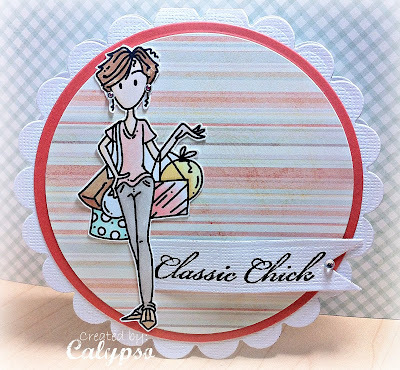 Beautiful shaped female card...love the image...thanks for joining the Divas! How cute! Love this image, so adorable. Such a fun take on the sketch, too. Bet you are ready to get up for a while and get out to do some shopping, right? Soon! Great CAS card! love your new blog sweetie. And your card is great. Fabulous, love the simple design...thanks for joining us at Divas! Gorgeous card, love the cuteness of it and the colours! what a gorgeous creation, very clean and elegant! Thank you so much for sharing with us at Allsorts and good luck in the challenge.